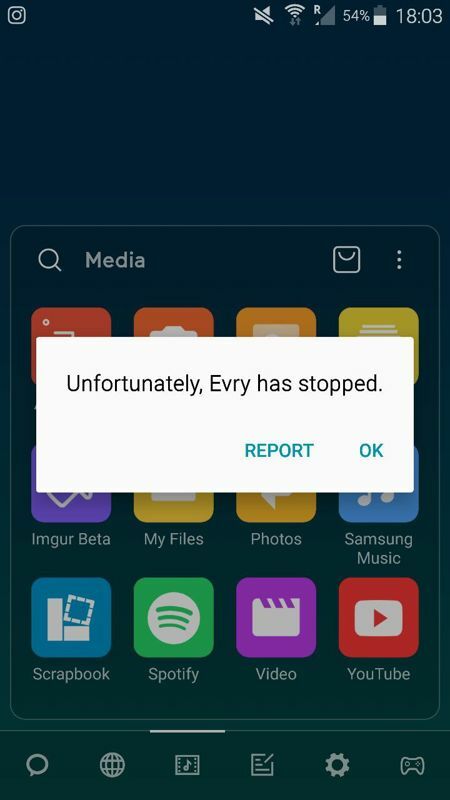 Today I am going to do a smoke test for the app called Evry. 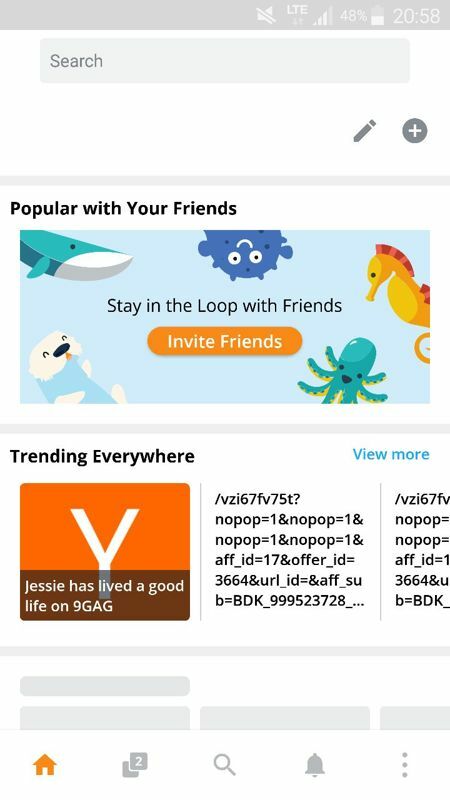 This app aims to change the way we browse the web, aggregate the content and socialize around it. After a brief test, I got the impression that the most critical parts here would be the main goal of the app and a positive flow. In this case, it will make sense to focus on the positive testing first. The app implements a good design. It also follows many material design standards which is good. I like the logo and color scheme and it uses good pictures around different places so it doesn't look empty when you use it. The spelling and texts look good and they are helpful, you can easily understand where you are and what you suppose to do. There are a bit may of them but I will go dipper into this later. 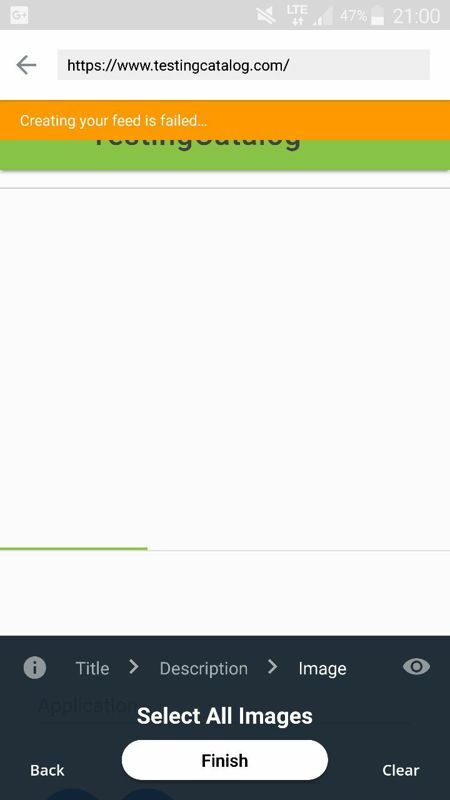 Most of the app menus work quite ok. For some reason, I don't have a feeling of using a fully native app (mostly because of the web browser) but main controls are responsive enough. There might be more but I believe that these three are more than enough. I was checking this app for 10-15 seconds before publishing on TestingCatalog for a couple of times and I also did around 10 test sessions from 30 seconds to 2 minutes each after that. Having an app description in mind which I read briefly, I opened the app and opened one website which appeared on the first tab of the homepage. My first impression was that this app gives you a possibility to leave comments on every website. The website I loaded had some problems with scrolling. I manage to recognize Upvote and Downvote arrows (Reddit like) and I was expecting to see some comments on it plus the interface where I can leave my comments. I didn't find them there this time and I decided to check it later. After that, I also discovered a web browser functionality in this app and a possibility to create your own decks (news feeds). To me, it looks a bit confusing because you can discover three different functionalities at once and two of them are also promoted on the home page (search as a web browser and deck creation). I am always suggesting to focus on one goal at the same time, especially in the beta testing stage. This also boils down to the question of who is the customer of the app and how it will be used. It is easier to make the app which users love when you focus on one specific need. So, for all these possible goals. Search and web browsing - it doesn't feel like a core functionality of the app. However, I would describe other use cases as "Enhanced web browsing". And in this case I will have to point to the core problem from my point of view - the web pages scrolling process is slow. Let's check other two goals and wrap it up. Commenting on every website. This sounds a bit questionable to my point of view. Most news websites have their own comments + you have Reddit for upvotes and aggregation and commenting. But, I can be not in a scope of the target audience of this app. I don't comment very often on the web. Content aggregation into decks. The most impressive part of this feature was a possibility to highlight titles, descriptions, and images on any website by yourselves. This can allow a user to create an RSS like feed for any website. I didn't manage to make it work but this feature can potentially be used by many people. The happy path for commenting. Open app > tap on the first website from Trending section > check the content (Issues 1 and 2) > Upvote > Leave the comment. Issue 1 - the website was m.9gag.com and the section with Upvotes, Downvotes and Evry comments disappears after scrolling. It also can be a problem with a website but I saw the same issues on other websites too. Issue 2 - the scrolling of the website was slow. I would mark this test as failed even if I managed to get to the end. Mostly due to these two issues. The happy path for deck creation. Open app > press on Add new deck button > press on Add any website button > search for TestingCatalog > open a website > press on Create feed button > name the feed as "TC" and don't check the checkbox > select titles, descriptions, and images > press Finish button (issue 1) > choose the deck category > press Done button (issue 2). Issue 1 - during the first attempt I received an error "feed creation failed" in the top notification message (Screen). Here it took me several attempts to get to the final point. Failed. The goal of the positive test was to reproduce a happy path user flow and the test can be considerate as failed if the process wasn't "Happy". Duplicated controls in the app drawer and on the bottom navigation bar. Normally, having the same controls in different places confuse the user. Only primary buttons should stay on the bottom nav and secondary buttons should go to the app drawer. The bottom nav bar is hidden on the search tab because of the keyboard. It is possible that it is not needed here at all because it exists on the home page or it can be moved to the top nav bar. Some trending websites have unreadable URLs as a thumbnail (Screen). They should display a favicon or maybe the title of the page. It is not possible to change website address during the feed creation in case if the selected website doesn't work. The address field is not accessible. App drawer buttons stop working if the user will sign out in the offline mode. Three dots menu on the bottom nav duplicate other controls. The home page has two "call to action" flows. The user will have to choose between searching and creating a deck. Usually, this issue decreases a goal completion and app retention rates. 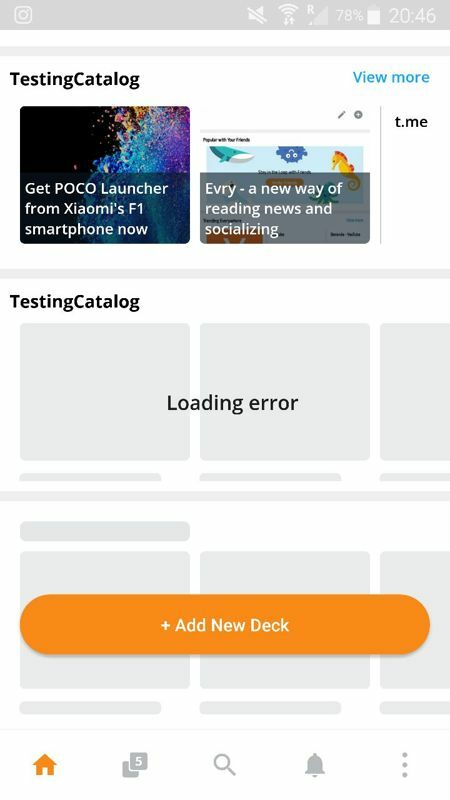 The app crashed after adding AndroidPolice website to the custom feed. It happened only once. That's it for now. Happy Testing!